I usually eat “my bars”, as I fondly call my #1 go-to food item, as a snack… midway through the day, when I need a little pick-me-up, and when the stomach gets a growlin’. But I recently found a bar that is perfect for breakfast. Quick, easy and portable. The name? BoBo’s Gluten-Free Oat Bars. They are filling, satisfying, tasty and absolutely perfect for that breakfast on the run. 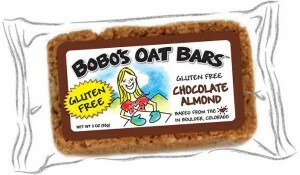 BoBo’s Oat Bars is headquartered in Boulder, Colorado and founded by a gal named Beryl Stafford. She started the company due to her love for nutrition, wellness and life. What originally started out as super-tasty creation for her oldest daughter, whom she affectionately called “BoBo,” the BoBo products are now available nationwide and still are handmade with the same love and attention to quality that this Mom originally created for her daughter. The gluten-free BoBo Bars come in some great flavors too: Chocolate Almond, Lemon Poppyseed, Peach and, my favorite, Maple Pecan. All these flavors are great any time of day… morning, mid-day and evening. BoBo Bars can be found at retailers across the country, and also on Amazon.com. Congratulations to BoBo Bars for being awarded this week’s Friday Favorite on BeFreeForMe.com … we love the way you are amazing people making some amazing products! This entry was posted on Thursday, April 5th, 2012 at 9:51 pm	and is filed under Friday Favorites. You can follow any responses to this entry through the RSS 2.0 feed. You can leave a response, or trackback from your own site. Boy do they sound good. The peach one sounds great. Something different for a sanck and a good pick up in the afternoon. When things get slow and need to stay awake. I would love to try these cookies, because most of the oat contains gluten, but not this one.